Hi folks…I’ve been tagged by my good friend Layne Macadam in TNBTBH! I wrote the first story several years back for a themed anthology that never eventuated and I really liked it. One of my beta readers suggested I make it into a series because she wanted to hear what happened to the other Muses, so I thought..why not? The heroine is a little trickier. I am thinking Jennifer Garner – she has the height and the heart for it. Can love survive across time and place? When Callie is found wandering the streets of Melbourne, she has no memory of who she is. 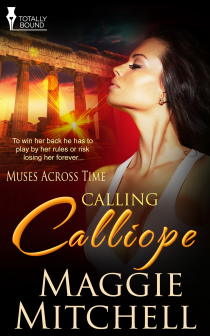 When a larger than life man appears, claiming he’s her husband, Callie immediately assumes they’re not together for a reason. But a violent criminal is angry with her for hiding his family and plots revenge, so keeping this giant of a man around seems like it might be a good idea after all. Gus might be a King in his own land, but this strange place is a different story. It took him six months to find his beloved Calliope and he is not leaving without her. Even if she can’t remember him. Now that she’s in danger, the need to rescue her is greater, but the stubborn woman won’t believe him. To win her back he has to play it by her rules, or risk losing her forever. Thanks for tagging me Layne! 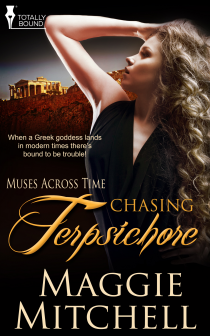 Chasing Terpsichore has release dates! And I’m hard at work on the next book in the Muses Across Time series. Watch this space! When a goddess lands in modern times there’s bound to be trouble. Banished from her home in Olympus and trapped in modern day Australia, Terpsichore does her best to fit in, but when she is mistaken for a prostitute she needs the services of straight- laced solicitor James Barrington to help. James Barrington is a man on a fast track to a stellar legal career. Being involved with a pole dancing tango teacher is not part of the plan. Together they fight a Titan rebel and a journey through the Underworld but can they find each other on the way? It already has a gorgeous cover, but I’ll keep it a surprise for now! I’ll be back next week with some wise words about revising that manuscript 🙂 That’s because it took me a few rounds to get this baby into shape, but it’s not too shabby now. I’ll tell you all about it next week.